GIMP Forums / GIMP / Beginners / Substitute an image after transform/etc. Is it possible to change the images on the individual windows after applying perspective, shadows/etc? I want to make the overall appearance first, then decide what content to put in the windows. RE: Substitute an image after transform/etc. Hmm, learning scripts seems like overkill. I guess this is something better done with a 3D modelling program. I'm suprised Gimp doesn't seem to remember the sequence of actions you took, so you can go back and modify one step without repeating everything after it. Seems like making any complex graphics would be a nightmare of meticulous planning and hand sketching. (Sep 3, 2011 09:47)Unrest Wrote: Hmm, learning scripts seems like overkill. I guess this is something better done with a 3D modelling program. A macro for Gimp, don't hold your breath. A lot depends how keen you are to set up a system. You can transform an image into a perspective shape using ImageMagick. You would need one command for each image/layer but would be usually in a batch file for convenience. 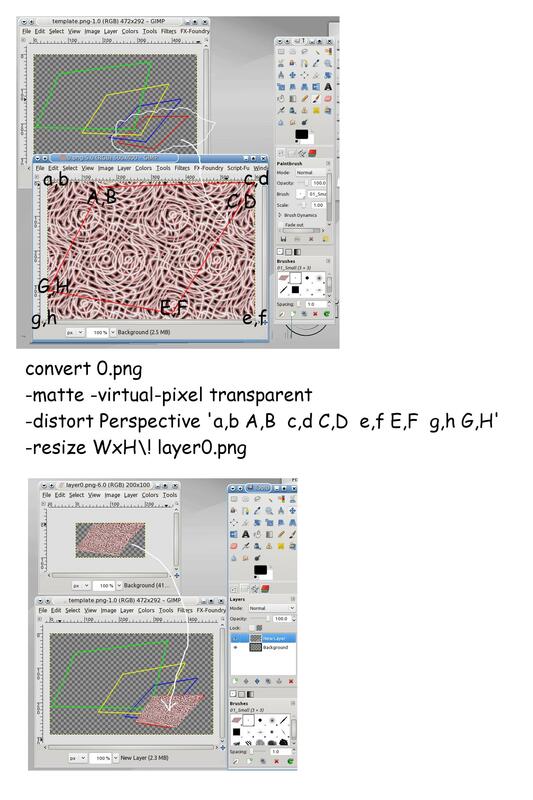 Then it is just a copy /paste job in Gimp. split the command for clarity/converience, it should be one line. Heading off to the pub for a beer & watch rugby so best of luck. Cheers. I've done it by hand already, making blank "windows" in a 3D app to show me where to place the perspective tool corners. So at least I can do it roughly and slowly. If i need more accuracy or too many changes I'll come back and try your way.